Seminal Shaw Brothers hit which sees director Chang Cheh lay his blood-red slasher stamp on Japanese cinematic tropes and launch an iconic Chinese hero in the process. 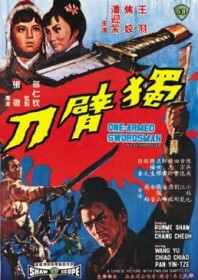 The overarching image of the one armed servant’s son Fang Gang – slicing up Imperialist kung fu scumbags with his sawed-off broadsword – is as resonant an image of cult Hong Kong action cinema as Lone Wolf and Cub is in Japan, or Captain America in the US. Former polo champion Jimmy Wang Yu steps up to leading man duties to play the innocent young hero, a role he would continue to milk long into his career. He starts the film with two arms; the son of a murdered servant who is adopted into the sword fighting family of kindly Master Qi, learning the ways of his exemplary Golden Sword. Feng faces class derision from Qi’s wayward impetuous students and only blood daughter, so he decides to flee the nest only to be challenged by the bullies whilst absconding. In an act of rather unnecessary violence, the master’s daughter Qi Peier chops his right arm off. Feng falls into the boat of good Samaritan Xiaoman who nurses Feng back to health, and together they dream of a brighter future away from the cruel martial world. But Feng’s bond towards his former sifu is all consuming and pretty soon he’s adapting fighting styles to match his disability, building the strength in his left arm until he can chop down a tree with his hand. So when a rival school starts bumping off Master Qi’s disciples thanks to a handy new hook sword, Feng is forced to jump back into the action. Chang’s film is a well measured and at times sensitive story about combating adversity which still manages to have fun in the process.